Ah, your bars are higher than the saddle, by how much, is that why there is a bit of hammock? mine are 30-35mm lower, but I' probably heavier. Also your reach seems much longer than mine. Suits your Hewitt well, that saddle, it does. The bars are not much higher, perhaps a few cm. The saddle is actually at least a cm or so too low currently, but the seatpost is stuck fast in the frame (my fault). A visit to the Seat Post Man is needed this year, I think! Think the reach is actually a little too long. could do with at least a 1cm shorter stem really. On this bike I mostly ride with my hands somewhat behind the hoods, near/on the forward bend. I'm a little too stretched to be on the hoods all the time. 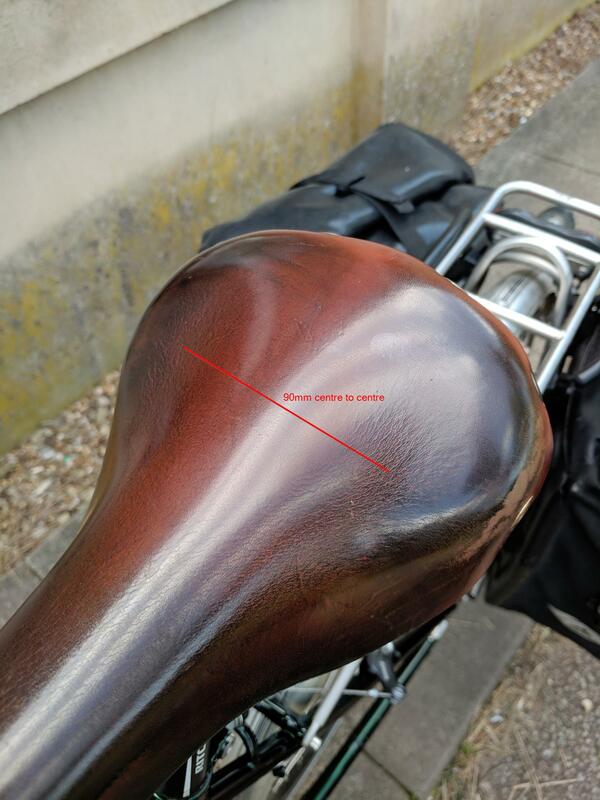 Saddle is about 4 or 5 years old, it was the "natural" colour originally, but has developed a deep patina over time. The leather has gone a little softer than it probably should be, think in the early days I applied too much of the GB saddle conditioner. This is probably one of the reasons mine has hammocked a bit. If I get another GB saddle, I'll be more sparing with the saddle conditioner. It's very, very comfortable. Other bits of me may hurt, but after a 100k sportive or long day touring, my bum is still happy, I just don't notice the saddle. OT but I notice you've got your Super C rackpack positioned so the back is hanging off the end of the rack. 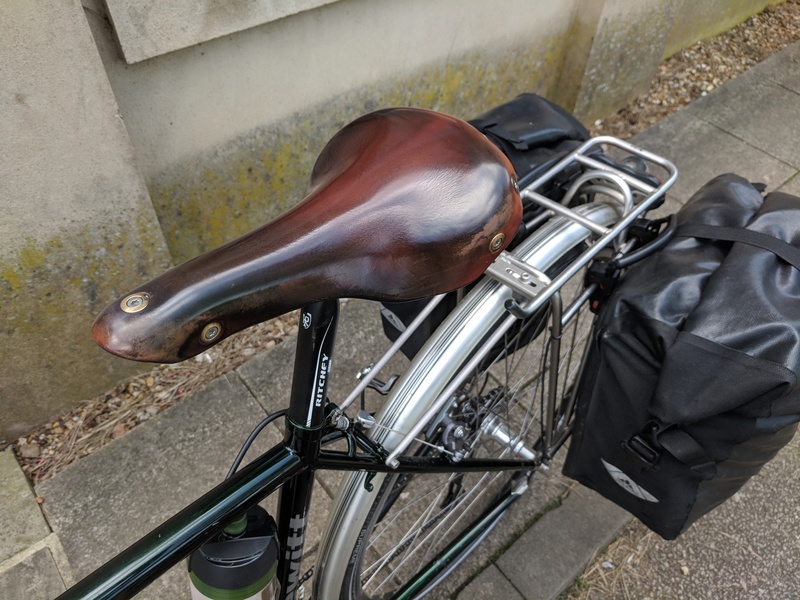 I presume this is because you find it either catches on your thighs or the lid gets trapped under the saddle and won't open easily if you have it all on the rack. That's what I find with mine, but my solution is usually to put it the other way round – with the little pocket facing forward. 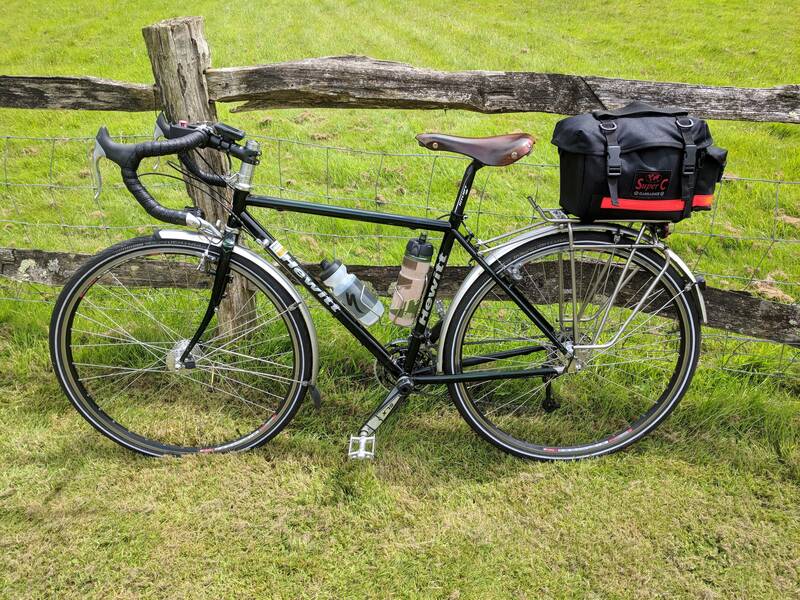 BTW that photo was take on the BHF London to Brighton charity ride last summer, I stayed overnight in London the night before and in Brighton for a night after, so the Super C rackpack was just the right size and more "aero" than using panniers. Well, the torrid affair with my delicate little French fancy is over, she has left me for another, one with a smaller bum. I do hope the new beau's bits don't go numb and drop off , like mine did. I have been trying a gilles berthoud galiber over the winter and it’s a tad on the hard side I would not fancy doing a flat 200 on it . Yes, that's one of the things I like about the GB saddles, all parts seem to be available as spares. I think I can live with it for now, it's not uncomfortable, but it's good to know the top can be replaced and I'll be able to re-use the titanium rails. I applied it to both the top and underneath of the saddle, leaving it to soak in overnight, before buffing-off the top (-only) in the morning. My mistake was to repeat this several times without much gap between applications - suggest you just do this once and ride for a bit, before considering to apply again. The other things that made a big difference for me in the comfort stakes were a) getting the saddle level right (for me, almost completely flat) and b) giving it time to develop little indentations for my "sit bones", though this took a while - however it was still pretty comfy even before then.